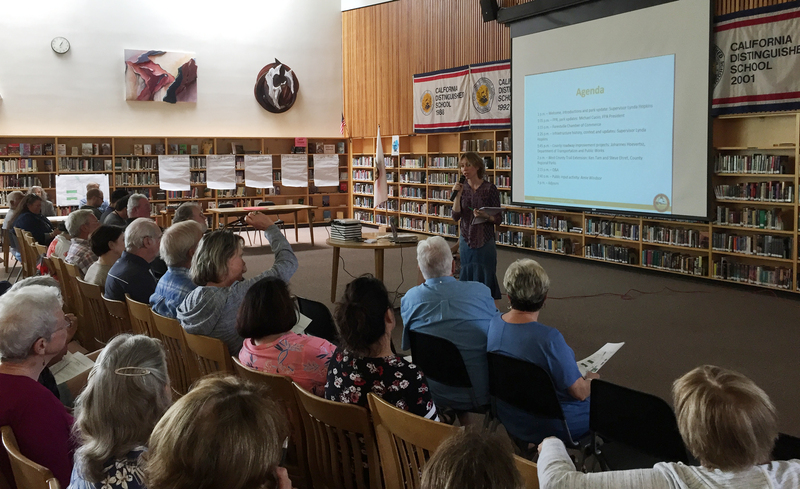 On May 20, 2018 Supervisor Lynda Hopkins, together with the Forestville Planning Association and Forestville Chamber of Commerce, held a town hall meeting in Forestville at the El Molino High School Library to discuss potential infrastructure improvements that could be funded by $4.5 million in quarry mitigation funds. County Regional Parks and the Department of Transportation presented six potential improvement projects that could be partially funded by those funds. In the coming weeks, Supervisor Hopkins will be working with county counsel, the Regional Parks and the Department of Transportation and Public Works to unlock the funds and allocate them to specific projects as prioritized by the public. Please check in with Supervisor Hopkin’s Facebook page, monthly columns in the Sonoma County Gazette and Sonoma West Times and News for updates. Those interested in receiving information can also sign up for her newsletter by emailing amie.windsor@sonoma-county.org. Also speaking at the meeting were Michael Cuoio, president of the FPA, Lucy Hardcastle, secretary of the FPA and Gary Harris from the Chamber. Michael opened up the meeting with a quick history of the FPA and Downtown Park. Lucy started a discussion about having a restroom in the Downtown Park. There were many questions about the costs, the placement, the rules around having large public events in the park and when a bathroom is mandated and when or if it should be locked up when no events are taking place. This is an ongoing conversation the community will continue to have. Gary spoke about the upcoming downtown to Youth Park parade, which the Chamber sponsors. At the point of the meeting, no one had signed up to participate. Gary later reported that there were quite a few entrants which you can read more about in Lucy Hardcastle’s July News & Events blog post. Skip down to “Youth Park Parade Winners”. People were also asked to make written comments about any concerns they had about the development and/or needs of Forestville. Below are the comments. Roundabouts at all intersections. This will slow traffic, prevent truck noise from starts and stops, aesthetically pleasing. I liked the idea of a bike path on Covey Road before Mirabel. Roundabout for Mirabel and 116. Stop signal light at River Road and Mirabel. Maybe just fix the visibility at 116 and Mirabel? Have more than one mic at meetings for better flow of questions. Combine shoulders and bike circulation for more expedient construction. There’s a lot of discussion about spending funds on infrastructure. 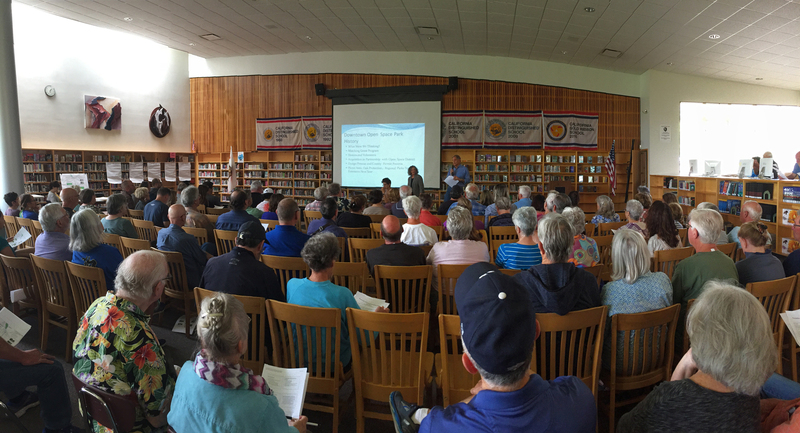 There are changes coming to septic systems in Forestville. Is there an ability to use some of these funds for sewer lines? Would like to see work at River Road and Martinelli. Wouldn’t affordable housing be a superior use compared to a high end hotel? Increase walkability in town, access to town. Offstreet bike paths wherever possible. Create adequate parking in town, at the town square. Parking needs will increase when bike trail connects into the town square. Need permanent restrooms at town square. Trucks and bike lanes do not mix. County ordinance limiting truck traffic on Mirabel Road from 8 a.m. to 6 p.m. I like a bigger picture/holistic view and hope that somehow the funds can be combines or maybe the county would grant a planner for the community to have a big picture for continual change. There’s nothing here to slow traffic as it will make those noise louder as trucks slow down and speed up. The Mirabel corridor and in particular around Spears, is highly dangerous. Is this the most high congested truck corridor in the county? It’s ridiculous. The trucks literally shake our homes and are impossibly loud. If we were a wealthier community/area, I don’t believe this would be the case. Please make bike paths a priority. Tap into hospitality tax. I would give up roadside property for a bike path along Martinelli Road. Restrooms bring in homeless. If approved, lock them at night. It is very disappointing people don’t see roundabouts as a feasible option. They work! Roundabout in front of Spears and 5-way intersection.